A screenshot from dash-cam footage of a road-rage incident in Signal Hill in July 2018. Courtesy Robin Lim. 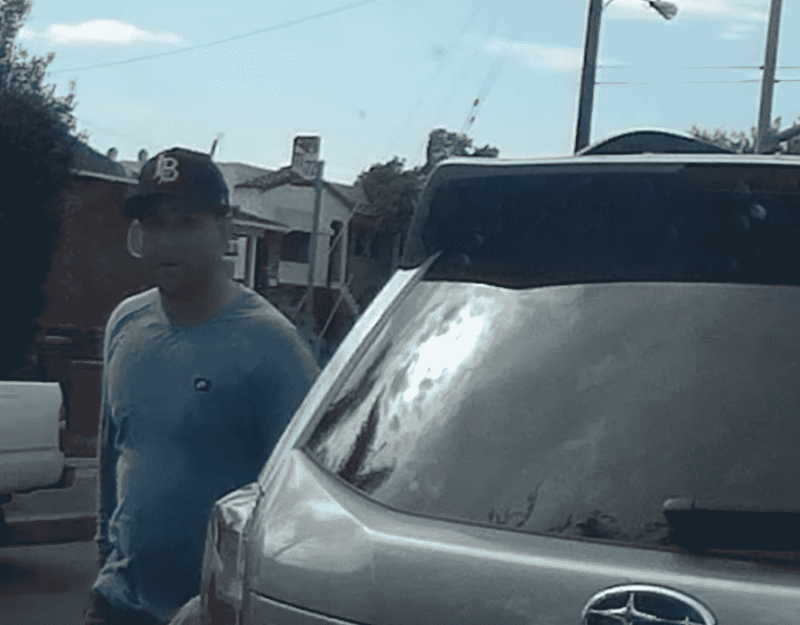 A man who was shown on dash-cam video cutting off and berating another driver in Signal Hill this summer has been charged with a misdemeanor, according to authorities. Prosecutors filed one count of disturbing the peace with offensive language against 28-year-old Leroy Zion on Monday, according to Los Angeles Count District Attorney’s office spokesman Ricardo Santiago. The dash-camera video that prompted the charges was recorded July 18 on Orange Avenue near the 405 Freeway, according to Robin Lim, who posted the footage on Youtube. It shows Lim passing an SUV. Moments later, the SUV overtakes Lim from the left, swerves in front of his car and suddenly halts, forcing Lim to stop. The SUV’s driver gets out and starts yelling. “Learn how to [expletive] drive you piece of [expletive],” he says before yanking on Lim’s car door handle, according to Lim. Lim repeatedly tells the man to please stop. The man soon returns to his SUV and drives off. Zion used “offensive words in a public place, which were inherently likely to produce an immediate violent reaction,” prosecutors allege in court documents. It wasn’t clear exactly what language prompted the criminal charge. Santiago, the spokesman, declined to answer that question, saying he wasn’t able to comment on any evidence at this point. Zion’s first court date is scheduled for Nov. 7. The Long Beach Post couldn’t reach Zion Thursday morning. A message left at a phone number listed for him in public records wasn’t immediately returned. Lim told the Post earlier this year that he feared for his safety after the incident knowing the other driver was free.